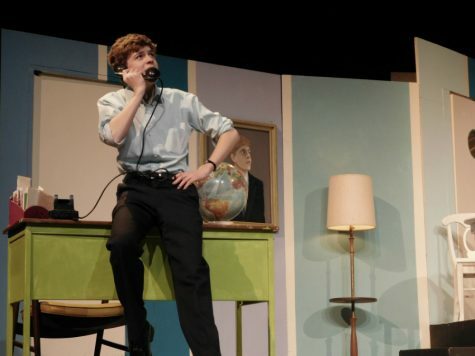 Fast paced, snappy, with just the right amount of ‘risqué’ humor, senior Aaron Vanek’s adaptation of the 1960 french play “Boeing Boeing” kept the crowd roaring with laughter last night. 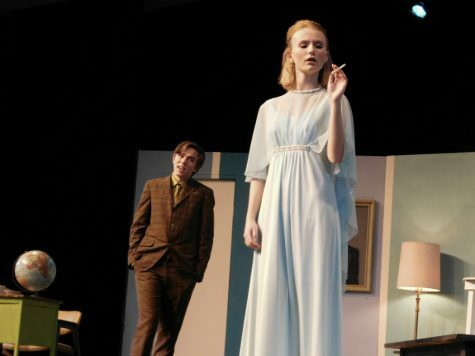 With a fantastic cast and impeccable costuming, the play truly captured the 60’s-set farce production. 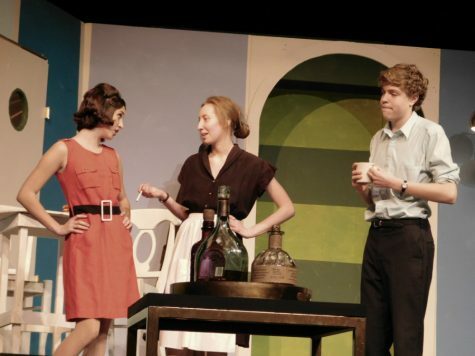 Boeing Boeing, written by Marc Camoletti, is set in Paris and is the dramatic story of protagonist Bernard fiancéed with three stewardesses — each oblivious to the others Bernard is seeing. Bernard has managed to see each of them at different times, using his “charts” to keep track of the times. But when a new, faster Boeing jet changes the schedule and all three women arrive at the apartment one night, Bernard and his visiting friend Robert are forced to scramble around in order to keep Bernard’s secret safe. Vanek turned the rather raunchy play into a more family friendly version, while keeping some a few dirty jokes here and there to maintain the play’s essence. Although it was a relatively small cast — only six characters, and an understudy –, each actor embodied their assigned role perfectly. Especially the french maid Berta, played by Rachel Olivarez, who promised a laugh whenever she walked on stage. Witty, impatient and with a perfect accent, Olivarez was one of the main highlights of the play. Bright colors kept us engaged whether it be the air hostesses chic costumes or the walls of the room. The 60’s design brought a sense of nostalgia to the parents, and a cool retro feel for everyone. The italian air hostess, Gabriella, sported a perfectly coordinated bright yellow get up with a pair of butterscotch shoes to tie it all together. Overall, a great production, both wonderfully staged and wonderfully acted. The ushers were welcoming, the audience was excited and a classic show with a modern twist was a great way to end the night.